Current Opinion in Solid State & Materials Science aims to provide a snapshot of the latest research and advances in materials science. 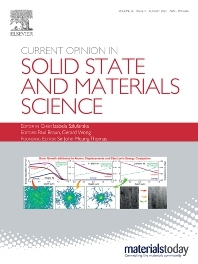 Every year, in six issues, Current Opinion in Solid State & Materials Science publishes a series of reviews covering the most exciting and developing areas of materials science. Each issue contains 2-3 sections of reviews commissioned by international researchers who are experts in their fields. The result is a journal that gives the materials scientist the opportunity to keep informed of all the current developments in their own, and related, areas of research, ensuring the cross&dashv;fertilization of ideas across an increasingly interdisciplinary field. Topics covered regularly include: Electronic Materials, Solid Catalysts and Porous Solids, Synthesis and Reactivity of Solids, Optical and Magnetic Materials, Metals and Alloys, Biomaterials, Characterization Techniques, Amorphous Materials, Molecular Crystals, Surface Science, Ceramics, Composites and Intergrowths, Modelling and Simulation of Solids, Polymers. Special issues containing 'one-off' sections on other important areas will also appear.